Blog TV guides without cable? When you end up cutting cable, it can be kind of confusing to figure out where to find a specific TV show or movie. You may be used to being able to browse a guide by hitting the button on the remote or even navigating to the TV guide channel if you’re really old school. Things can get especially confusing if you have more than one service and have to navigate between the two. We’ve come across a handful of extremely useful tools that are too good not to share. These tools will give you a few different ways to figure out if you can stream something and where you can stream it as well as what shows are playing live. Can I stream _____ online? “Can I stream HGTV?”. “Can I watch Game of Thrones online?”. These questions and thousands like it are asked online every day. Even our inbox gets filled with people asking the same type of question on a daily basis. Asking if something can be watched online is a question as old as digital video itself and one that we don’t see going away for a long time. Most of the time the answer is yes and the person asking it probably already knew that. The real question that people want answered is “where can I stream ____”. We’ve tried multiple different sites and programs to answer this question and figured we would share our opinions of them with you. TitanTV.com is a perfect example of not judging a book by its cover. A majority of the cord cutting TV guides you’ll see online are centered around movies or on-demand TV shows. Services like Sling TV, DirecTV Now, Playstation Vue, and many others we write about on this site also offer on-demand content, but it isn’t the main focus of the service. The main purpose of these services is to provide live television as an alternative to cable. Since not every service will have exactly what you’re looking for, many people find themselves with a few different ones at the same time. If you have Sling and an antenna that picks up over the air channels, figuring out what’s playing on each at a given time is a hassle. Before a user sent us TitanTV.com, the best way we could figure out what was live on each service was to check the “what’s playing now” page for both. Now, it’s just a matter of setting up an account on TitanTV and browsing it like an old school TV guide without cable. As you can see from the picture above, graphics aren’t really TitanTV.com’s strong suite. 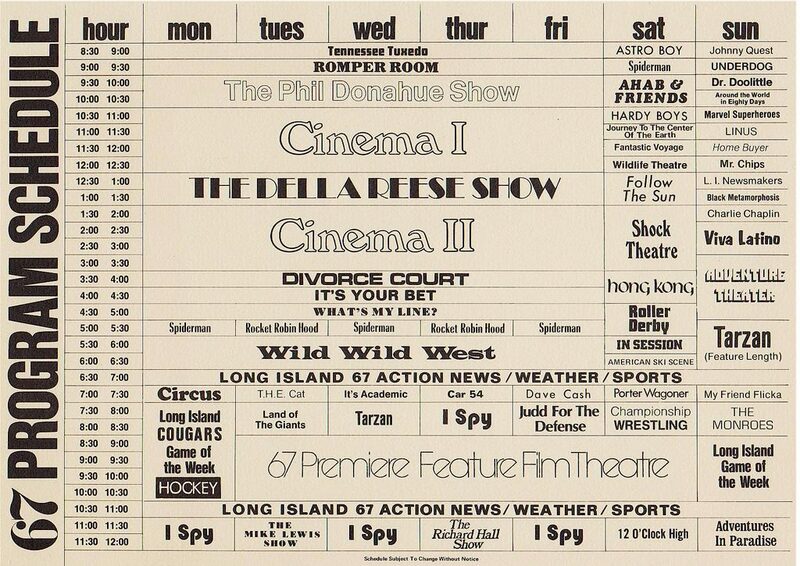 Although it looks outdated, if you’ve ever used a TV guide before you’ll feel right at home. The design of the site is simple and it works well. You can create an account and add different “channel lineups” that you may have. 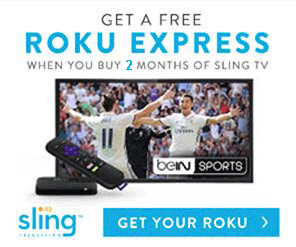 For example, if you have an Antenna and Sling TV, you can add both of those. Once you do that you’ll be able to view all the live content on those services specific to your location. 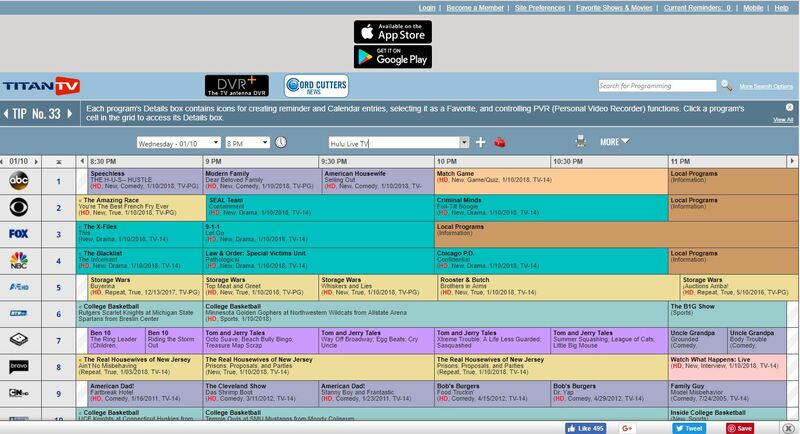 You can jump between days, view future programming by clicking on a channel, or filter by specific channel line ups and search only one service. For those who like to play it REALLY old-school, there’s even a really easy way to print the page. Although TitanTV doesn’t offer every service, it includes most of the major ones and is both consistent and reliable. If you look past the late 90’s web design it can be a really helpful tool for cord cutters. You can even download the app and have your TV guide without cable with you wherever you go! Justwatch.com is a lot to take in a first, but once you know what you’re looking at it’s a gold mine of information. 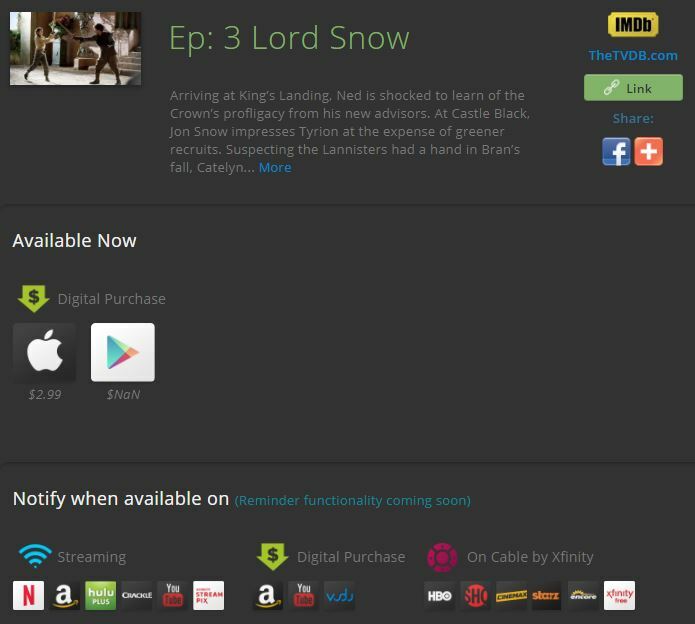 Justwatch is a search engine designed specifically for cord cutters. They use TheTVDB‘s database to build their search engine and keep it as up to date as possible. It allows users to search for a movie or TV show and instantly learn which services stream it for free, for a purchase price, or with a subscription. Unlike the websites on our scam streaming site list, Justwatch doesn’t host links to the content, just to the streaming service. Justwatch.com provides information, not content, and is extremely good at it. 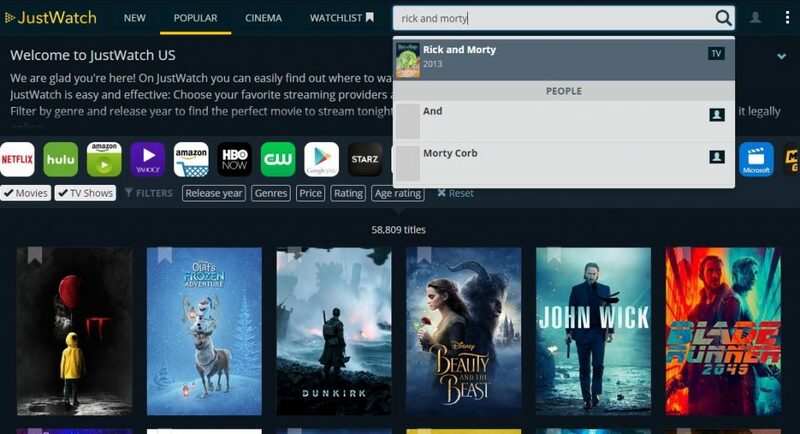 To show you some of the sites features, we’ll do a quick walk through to find out how to stream Rick and Morty online. Visit the homepage of justwatch.com and type the show or movie you’re looking for into the search bar. After a second you’ll see some options pop up on a drop down. Click the title that you searched for. After you click on the correct show you’ll be brought to a new page. Take note of the page load speed. You might not even notice it because of how quickly it loads, but once you see some of its competitors you’ll understand why we like justwatch.com so much. The new page will display a bunch of information about the content you searched for. For our Rick and Morty search, you can see all three seasons along the top. If you scroll down a bit, you can see the entire episode list for the season that we’ve selected. If you click on one of the arrows beside an episode you want to watch, you’ll see the streaming information for how to watch that episode. 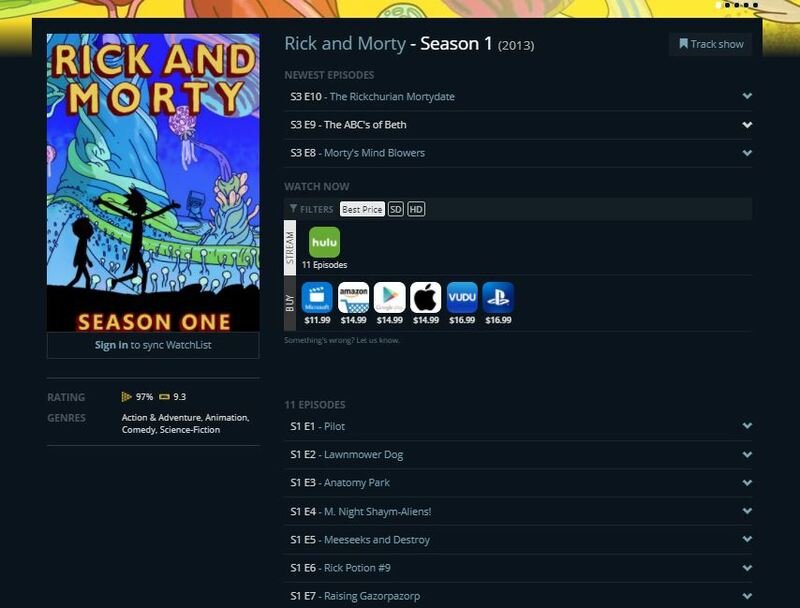 For Rick and Morty, you can stream it on Hulu, or purchase it through a Playstation, Amazon, Google Play, and a few others. Clicking on one of these buttons will bring you directly to that service’s links for the episode/movie you selected. Pay for your content and you’re good to go! One of the major reasons we like justwatch.com over some of its competitors is its interface and load times. The site has so many different filters that can easily be toggled on and off and has so much data that it’s amazing their site is so fast. The user interface is simple and there’s never a question of what you’re looking at. The data presents itself in a way that you can quickly tell what everything does and easily filter out what you don’t want to see. Since they use thetvdb.com as their main source of data, it’s constantly updating and adding new content. We actually used thetvdb on an early version of our cord cutting database, but found that there was too MUCH information for our purposes! Although the design and site speed is great, justwatch.com suffers from the same problems as most cord cutting search engines. The database for movies is a lot more populated than TV shows and it means there’s a large gap in their data. In our search for how to watch Rick and Morty online, we saw that the only streaming service available that showed it was Hulu. Technically, you can watch a majority of Rick and Morty online on Cartoon Network. Even though some episodes are locked behind a cable subscription, about half of them are completely free. You could also watch some episodes through Sling TV and even watch new episodes live as they come out because Sling Blue gets Cartoon Network. Another benefit of Justwatch is that has mobile apps to make searching while on the couch even easier. You can create an account and track shows as they get added to certain services if there’s something specific you’re waiting for. Although all of this doesn’t cost you any money out of pocket, you’re still going to have to pay (with your information). Justwatch.com tracks user’s movie and show preferences, as well as location and other information to sell to companies. They sell this data to movie advertisers and similar companies than can benefit from large amounts of mostly anonymous tv/movie data. Although the data doesn’t directly have your name tied to it, if you’re concerned about your information being used to benefit others, Justwatch.com might not be the best search option for you. CanIStream.it is not only a clever name, it’s a great and accurate description of the site. As the name suggests, it gives you the answer to if something can be streamed online and, more importantly, where you can find it. The site can sometimes have really long load times and isn’t 100% accurate (you’ll see in our example), but it’s such a great resource and has a huge library of content that it’s still worth checking out. We’ve found it’s much more reliable for Movies and single episodes of a show rather than entire series or seasons. Let’s take a quick walk through the site to answer the question “Can I watch Game of Thrones online?”. When you first enter CanIStream.it you’ll see a homepage that looks like a typical search engine. Underneath the big search bar are two different tabs; one for searching movies and one for searching TV shows. Type “Game of Thrones” into the search bar and then click the “Search TV” button beneath it and hit the enter. If there is more than a couple of matching titles, navigate to the correct one. 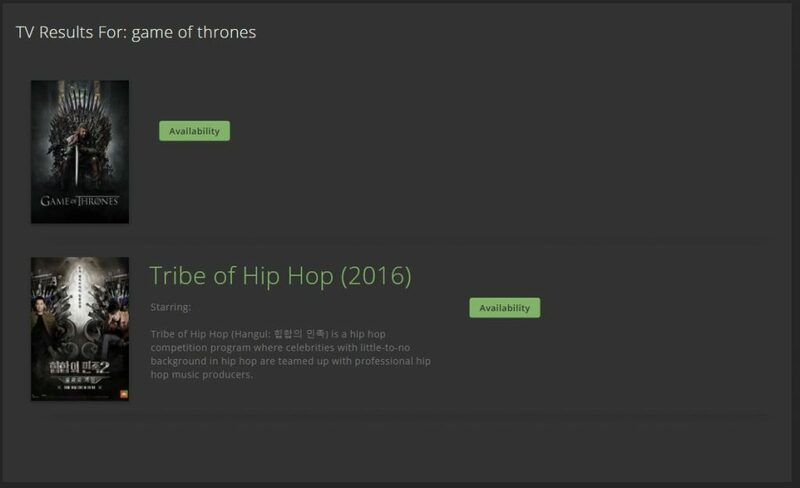 In our case we have “Game of Thrones” and something called “Tribe of Hip Hop (2016)” below it. Here it’s obvious which one is correct, but if your search has similar names just look at the images. Click on the “Availability” button of the correct show and wait for the page to load. In our experience, the load time is a little longer than most sites, but once you see the amount of content it produces after the search you’ll be a little forgiving. On this new page you’ll see information about the show including cast, a summary, air dates, genre, and a link to IMDb and TheTVDB.com for the show. Below this blurb of information is a summary of each episode and buttons to change season. If you click on the “Availability” button next to the episode you want, the summary will be replaced with different information. From here, you’ll be able to see the different ways you can watch the content now and for how much. Our example below shows that we can purchase the episode on the App Store or through Google Play. Canistream.it feels like it just falls short of Justwatch.com. It doesn’t directly say it, but it’s probably pretty safe to assume that Canistream.it also uses theTVDB to run, especially considering they link to it on each content’s page. This means that when comparing the two sites they are perfectly tied in terms of content. When you start looking at the minor details and features of the two sites, you can see how Justwatch.com edges out Canistream.it from the beginning. Canistream.it has a longer load time for its pages, a less intuitive filter system, less invasive ads, and did we mention longer load times? Canistream.it by itself is a great resource. It’s equally as useful as its competitors, contains just as much information, and is pretty intuitive. It also allows you to get notifications for added content on services, has mobile apps, and updates daily. You would think that a direct comparison between Canistream.it and Justwatch would be reasonable and even fairly close, but if you start using both you’ll see why it isn’t. We kept looking for something that Canistream.it had over its competitors so we didn’t feel like we were unjustly hating on it, but it continually fell slightly short.